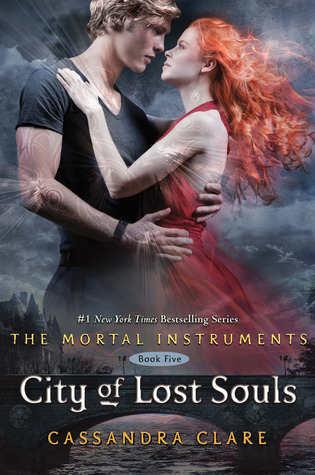 In the 5th installment of the Mortal instruments series, we find Clary looking for her boyfriend Jace. He has disappeared from the roof where she last left him. The council has put looking for him on the backburner, and of course Clary takes it upon herself to look for him. She soon finds out that he is with none other than Sebastian, her brother with demon blood. Is Jace there against his will, or is something more sinister at work? I just want to say right off the bat that I adore this series. I mean head-over-heels adore! I love the main character Clary in these books. You can actually see how she has gone from this little girl—to this amazingly brave and selfless person. At first the different POVs through me off because I haven’t read a book with this many POVs in a long time, but somehow they come together seamlessly. We get to see from the eyes of so many in these books. Simon is struggling with being a vampire, Isabelle is struggling with the idea of wanting Simon, Alec is struggling with Magnus’ immortality—so as you can see it’s a whole lot of struggling. That’s one of the many great things about this book. Even though the main plot is the fact that Jace is missing, there are so many subplots that the book moves along so fast and at every turn you are captivated. Each turn you learn a little bit about each character and their strengths and weaknesses. In this novel you even get a glimpse into who Sebastian (aka Jonathan) is and it strengthens this story as a whole. There are definitely a lot of heart pounding moments in this book. A fantastic novel from a fantastic writer!! I can’t wait for more!